Ross County captain Richard Brittain has signed a new one-year contract that will keep him with the Staggies for their debut season in the top flight. 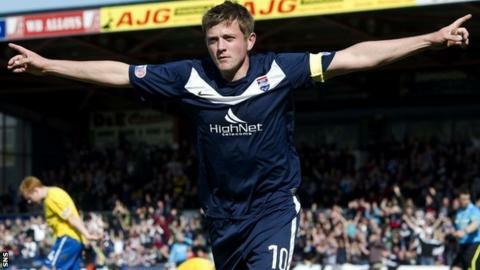 The 28-year-old midfielder has been with the Dingwall club since 2008 and helped them win the 2011/12 Scottish First Division title. He was previously with SPL side St Mirren, having started his career at Livingston. County boss Derek Adams considers Brittain a "fantastic asset". He said: "Richard is a player I've known well for a long time, as I played with him at Livingston when he was just starting his career. "Knowing his temperament and ability I was delighted that we were able to bring him to Victoria Park and since then he has been a fantastic asset to the club in his four seasons with Ross County. "He and his team-mates have been responsible for gaining Ross County national and international recognition thanks to their performances on the pitch. "It is therefore fitting that Richard will continue to lead the team on and off the pitch as we face the greatest challenge in the club's history."